Leaving the economic turmoil of Greece behind, Stergios Gogos initially set off to discover the world. By the tip of Africa he’d found much more than he’d bargained for. 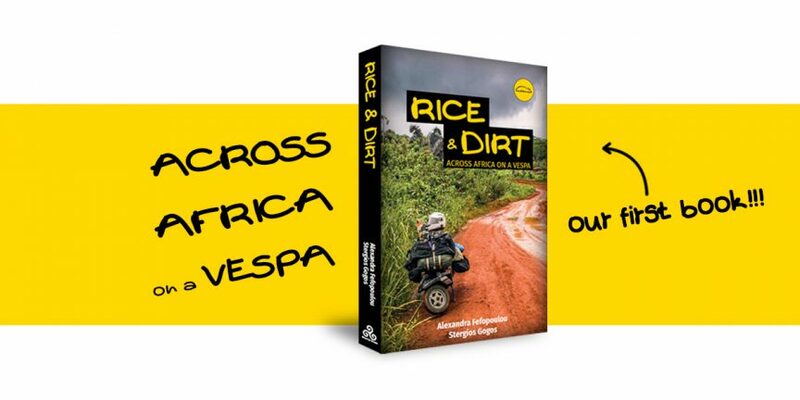 RICE AND DIRT | OUR FIRST BOOK! Follow Stergios and his PX200 Vespa scooter across deserts, mountains, tropical beaches, forests and savannas. Envisage breathing the air of the countries he visited; taste the food, share his concerns, fall repeatedly and get back up from the mud in the Congo, enjoy both solitude and the company of others. But above all, get to know the people that would change his life immeasurably; and meet one in particular. This is a story of physical, emotional and mechanical challenges, of selfevaluation and blossoming relationships. Roaming the roads of Africa through the unpretentious writing style of Stergios and Alexandra, we are led to a place much deeper than any travelogue could take us. This book manages to steer clear of literary travel classifications and thrills with its liveliness, eloquence and welcome candour. "Funny, perceptive, revealing and well written. Oh, all right then, it’s a very good book." "A story that spells out the importance of packing a smile; highly recommended." "The lilting and uplifting text transports you into Africa’s heady blend of colour, challenge and corruption. 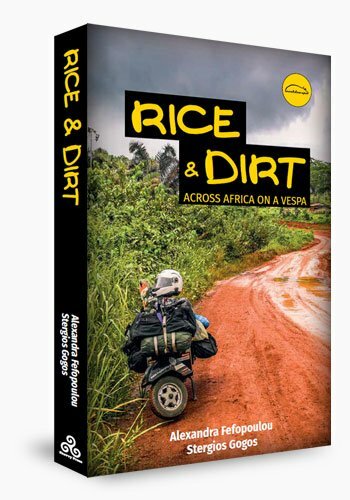 Infused with mischievous wit and enlightening observation, Rice & Dirt might just make you want to point a Vespa towards sub-Sahara." Alexandra Fefopoulou travels and writes. She studied Social Anthropology and History to gain a deeper understanding of the people and their cultures and left Greece, her home country, in order to conduct fieldwork in Africa. There she met Stergios and since that day back in 2014 they have been travelling the world together. Stergios Gogos is an amateur videographer and photographer, a motorcycle mechanic and a techie, but above all, he is a traveller. In 2013 he rode his Vespa away from Greece to see if the world is indeed a good place to live. 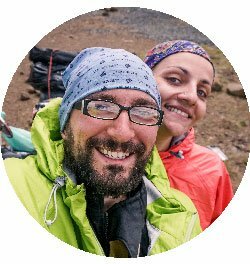 Together Stergios and Alexandra make a travelling duo combining their passions: they write, film, photograph and ride their Vespa around the world. They publish their stories and videos in travel/ motorcycle magazines and other media, as well as on their website: worldvespa.net. Rice & Dirt is their first book. Not only is this a really entertaining read……there is also a huge amount of amazing information woven throughout the book…..especially if you’re a traveller! Well done! Can’t wait for your next one! Safe travels! Over the years there have been plenty of debates about what an adventure bike actually is. I suspect that most readers will say it’s the bike you go adventuring on. But a scooter? 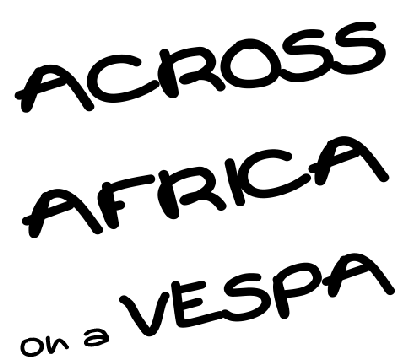 Yep, this is the story of a Vespa scooter and a nut ( in the nicest possible way) heading down the west side of Africa. And it’s a great story. Very nicely written with some wonderfully different angles and thought processes. As I got to the last pages I was really disappointed that it was coming to an end! I absolutely loved Rice and Dirt! It is beautifully written with an authenticity, honesty and attention to detail you hardly find in travel stories. 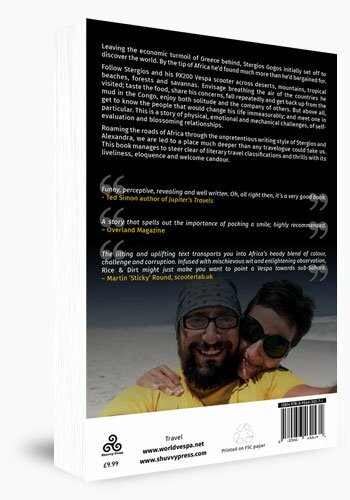 Having travelled with Stergios across some of the tougher countries in Africa, I was curious how he would manage to capture the experience in words. I kept a diary but when I read it today, it doesn’t quite do justice to the surprise, anger or love I felt at the time of writing. Where I failed, Alexandra and Stergios got it spot on right. Already when travelling together, I noticed that Stergios is gifted with a great eye for everyday details others might overlook. And Alexandra did a wonderful job bringing these detailed accounts to paper without losing any of the emotional highs and lows riding a bike across Africa has in store. The writing is lively, heart-felt, funny, sad and honest to the core. Some parts were so familiar as if they were taken straight from one of the long conversations Stergios and I used to have on the road. I particularly liked how seamlessly Alexandra was introduced to the story. This is a beautiful final touch to the African part of your journey and hopefully the opening chapter to your next book. Rice and Dirt left me happy and sad at the same time. Happy because it perfectly captures the experience of riding a small bike round Africa. At the same time, it also made me deeply nostalgic for all those great moments we shared. I really hope both of you continue your journey – and please keep writing books. It was an absolute pleasure reading this one and I will surely read it several more times! Rice & Dirt is a cracking read. In today’s large Adventure bike times it’s truly refreshing to read a personal journey on a small cc bike. The character of Stergios shines throughout the journey. The breakdowns what he sees on the road and the route he takes which is by no means an easy route to take. The book could have been twice as long. I rate this with very few others that sit on the top of my list of Adventure travel books. Hi guys, we met at the Overland Event last month and I picked up a (signed) copy of your book. I just have to say how brilliantly it is written and the short ‘chapters’ make it great for reading in the toilet and making sure I don’t read it all in one go! ; that would be all too easy. A great format, lovely stories, understandable thoughts: in all it is superb. PLEASE DON’T CHANGE YOUR WRITING STYLE in the next book!!! Have fun and wish I was with you both. For other ways of buying the book or any questions, don’t hesitate to contact us!